Best Blu-ray player to burn videos to Blu-ray disc and play on TV. Edit Blu-ray videos with different features. Provided 100+ free menu template designs and customized features. Toolbox with functions of Video Editor, Data Disc, ISO to DVD, One-click Burn Blu-ray Disc, etc. Blu-ray Disc won the HD format war finally. Blu-ray disc is the most popular format nowadays. It is a digital optical disc data storage format. The main reason to design the format is to supersede the DVD format. This format is capable of storing the High Definition and Ultra High-Definition quality videos. It is the Blu-ray discs which can store original quality of the videos and hence, we require an efficient Blu-ray player to play the HD quality and Ultra HD quality videos. Here we list the top 6 free Blu-ray players for Mac and Windows. Wondershare DVD Creator is a powerful and smart DVD toolbox. It is a tool that will meet all your DVD needs easily. The software can burn DVDs with one click. It can directly burn videos of different formats to DVD at once. You can also create DVDs with video of any format. 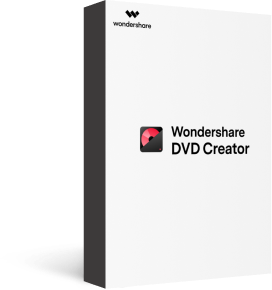 With the help of the Wondershare DVD Creator, you can easily burn videos even to a Blu-ray disc. The software is available for both Mac and Windows operating system. It is the best free Blu-ray software alternative which allows you to burn video files to Blu-ray disc and playback on playable devices. 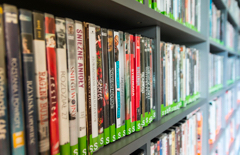 · Best free Blu-ray player alternative to burn videos in any format to Blu-ray Disc. · Create Blu-ray disc with real-time preview, super fast burning speed, and high quality output. 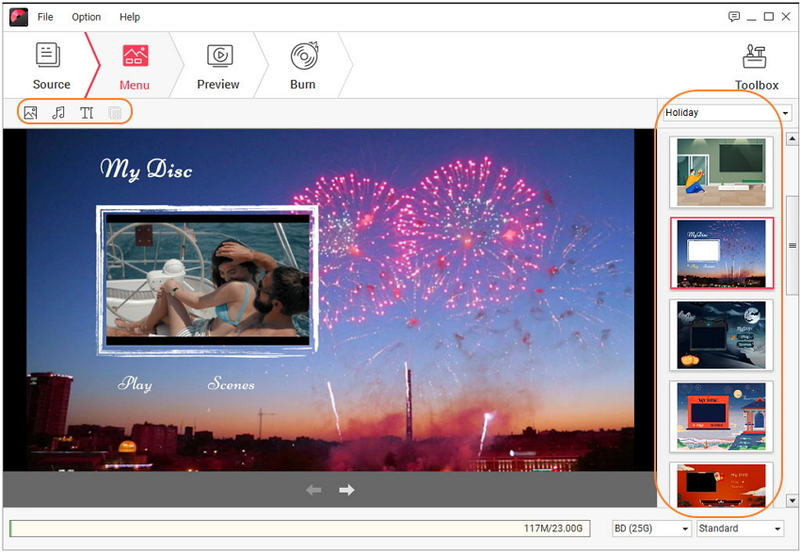 · Customize Blu-ray disc menu with different parameters like title, music, background picture, etc. · 100+ free static and dynamic menu templates from Nature, Sport to Movie theme. 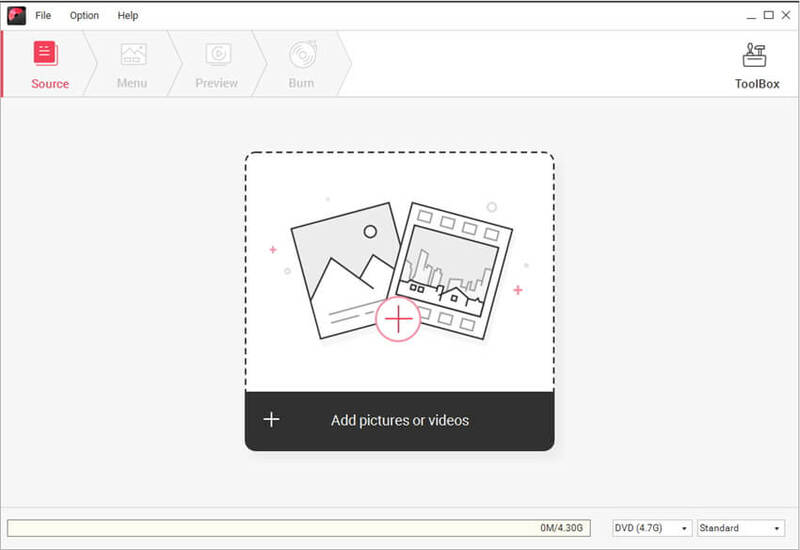 · Built-in video editor to personalize videos by Trim, Crop, Subtitles, Effects, etc. The first step is to download and install Wondershare DVD Creator on your Computer. Then launch the software on your computer and choose Create a Blu-ray(BDMV) Disc option. Now, in the next screen of Source tab, click on the " + " icon to add videos or pictures you want to burn. You can also use the drag and drop method to add videos to the software. All added files will appear on the screen with the title name and length. Adding multiple videos at once are allowed. You can also edit the videos if you want to. Choose the video you want to edit, and you will see a pencil-like icon. 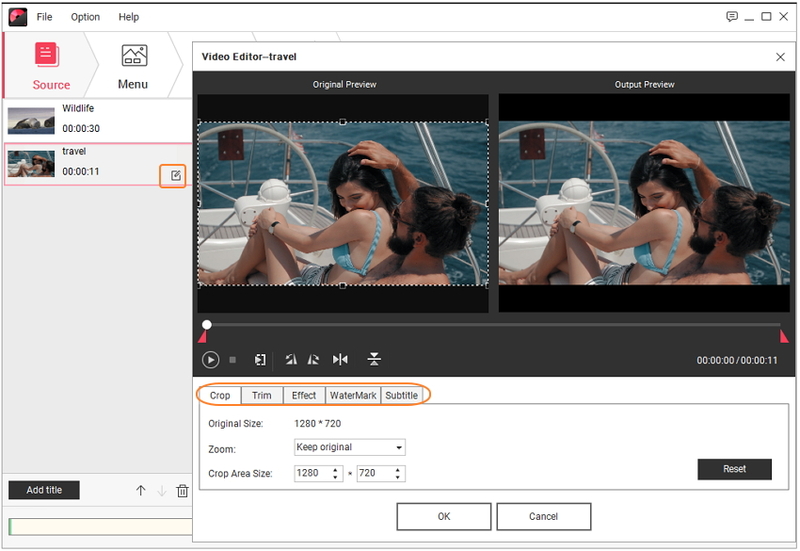 Click it and a Video Editor window will open, where you can crop, enhance, add effect, watermark, subtitle, and trim video as per your requirements. After you are done with the editing part, move on to the Menu option. Choose a menu template design for your Blu-ray disc menu from the right panel. Double click on the template thumbnail and it will be set as your default template. Click the icons upon the menu preview window, and you can change aspect ratio, background image, background music, and text to the videos. You're allowed checking all your creation by clicking the Preview tab. Finally, proceed to the Burn tab and preset Burning Settings, choose Burn to disc option to directly burn the video to Blu-ray disc with Wondershare DVD Creator. The burning process will be completed within a few minutes, then you can play your Blu-ray video disc on any playable devices. With time goes by, Blu-ray disc will replace DVD, maybe. However, not all video players can support Blu-ray disc. If you have a lot of Blu-ray discs, hope you can like the 6 best and free Blu-ray player for Windows and Mac listed below. VLC media player is an open source and free multimedia player that can work on cross-platforms. It can also play Blu-ray videos free on both Mac and Windows operating system. It also supports many other operating systems and can be used for various streaming protocols. The player offers a comprehensive support of formats, downloading, and streaming of the videos and audio files. Supported system: Windows, Linux, Mac. This player is highly customizable. The file formats supported are excellent. This player is expandable with the help of plug-ins. This player is completely free. The main drawback of the VLC media player happens during the metadata editing. Also, the interface of the media player isn’t attractive enough. DvPalyer is a free Blu-ray player only supported by Amiga computer. It supports various video file formats along with audio files. The software uses a fast and direct rendering algorithm to edit HiColor and TrueColor display. The DvPlayer has special requirement of a graphics card which has overlay ability. This advanced media player uses a new triple buffering technique for video streaming. It also supports multimedia keyboards so that you can make adjustments to the video. Supported system: Windows, Amiga OS. The software is fast as compared to some other players. The OS and the graphics are more impressive than the other players. After you start using the latest update, you won’t feel a difference between the previous version and the latest one. There is a risk that the installation of the latest version of the software will overwrite all the previous iBrowse and DvPlayer data. As the name implies, Free Blu-ray player is a free media application to play videos of Blu-ray format. 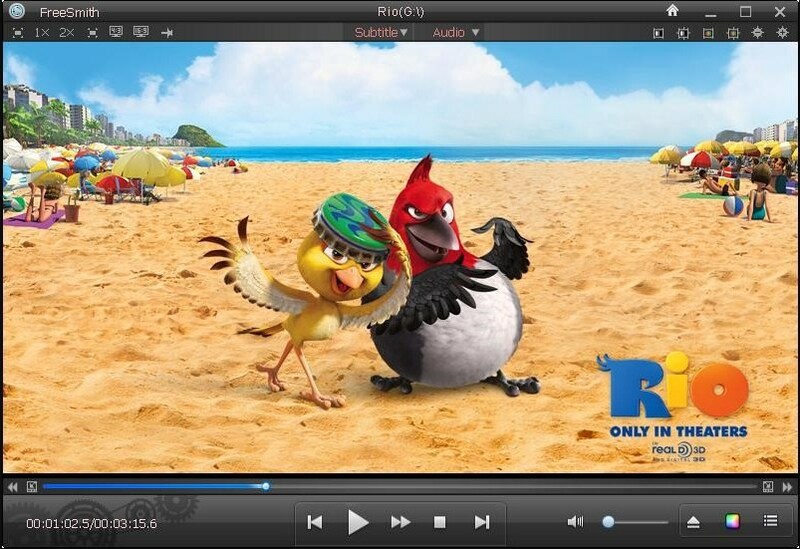 This player is the best alternative for most of the media players such as RealPlayer and QuickTime Pro. It is the basic version which is free to download, but if you want to take advantage of the other additional features that you can also buy the software. The application has an easy to use architecture only because of its streamlined layout. The free version of the software can be downloaded easily. It is very efficient in handling the other common video codecs. There are several advanced editing options missing from the software package. The compatibility of the software might vary according to the older version of OS. FreeSmith Video Player is the one which can play Blu-ray videos for free. It is an all in one media player because it can play music, videos, DVDs and Blu-ray discs. The format support of the player is also amazing as it includes the most popular formats such as MP4, 3GP, WMV, MOV, MPG, etc. It can also play online videos. The FreeSmith Video Player is a perfect combination of YouTube, DVD, Blu-ray, movie player, flash video player, and HD Video player. Another quality feature of the software is that it can play video files without the requirement of any preinstalled codec. The software has a very nice interface. The Blu-ray player is very efficient. The loading time of media files is long as compared to other media players. The software doesn’t have full-screen controls. Macgo Media player is the most versatile software which can easily work with different platforms and file formats. This is a completely free Blu-ray player for Windows and other OS. The amazing quality optimization and the stellar upscaling functions of the players make it the ideal choice to play Blu-ray disc, ISO file, and BDMV folders on the Windows OS. The perfect original sound support, free built-in and external subtitles, smoother Blu-ray experience, and online video playback support make the software stands out among all the players. Supported system: Windows and Mac. This software has a variety of features that are beneficial for the users. It can also buy the software to use it on multiple computers. It also supports mobile devices. This software does not support Linux OS. It has a high CPU usage. Tipard Blu-ray Player software is a free Blu-ray player for Mac and Windows both. It can easily play Blu-ray disc, Blu-ray folder, and all the videos with 4K quality, 1080 pixels, and also the general videos. The media player can also convert the HD videos to other formats such as .avi, .mp4, .mkv, .mpg, .wmv, etc. Along with video support, the software also supports the audio files and is highly compatible with the latest version of the OS. The software has such an amazing interface that it will make your watching experience extremely entertaining. It can easily play a Blu-ray disc, folder, IOS image file without any limitation on different platforms. Supported system: Mac and Windows. You can easily customize your watching experience. You can change the audio track, audio channel, and an audio device. It also supports subtitles of the videos. It lacks some advanced media player features. Now you know how to play Blu-ray for free on different platforms. All the above media players are efficient enough to handle the high-quality Blu-ray format. But, it is totally up to you that you want a cross-platform media player or software which is specially built for your favorite Operating system. So, you can use any of the alternatives for the Blu-ray video player. But using the Wondershare Video Creator for Blu-ray format videos is the optimum choice.